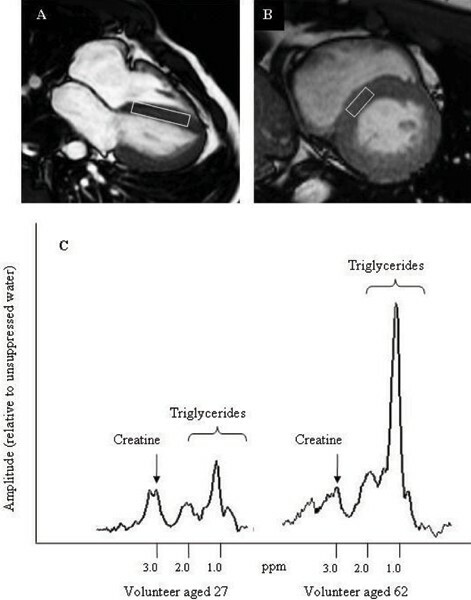 In the aging heart myocardial fatty acid oxidation is reduced, what may lead to myocardial triglyceride (TG) accumulation. In animal models of obesity and diabetes mellitus, myocardial TG accumulation has been demonstrated to be harmful to myocardial function. However, the role of myocardial TG in the physiologically aging human heart is unknown. Therefore, the purpose of our study was to evaluate the effects of aging on myocardial TG content, and to determine the effect of myocardial TG content on heart function. Forty-three healthy male subjects participated in this study. 1H-magnetic resonance spectroscopy (MRS) and MR imaging were performed at a1.5 T whole-body MR scanner (Gyroscan ACS/NT15; Philips, Best, the Netherlands). The spectroscopic VOI was located in the myocardial septum and MRS was electrocardiographically triggered and navigator echoes were used for respiratory gating. Flow velocity mapping across the mitral valve was performed to assess left ventricular diastolic function and a standard gradient echo sequence in short axis orientation was performed to study systolic function. Blood samples were taken prior to MR scanning. To detect determinants of myocardial TG content and LV function, univariate and multivariate linear regression analyses were performed. P < 0.05 was considered statistically significant. Mean age (± standard deviation; range) of the studied subjects was 44 ± 15; 20 – 66 years and BMI was 25.9 ± 3.1; 19.4 – 34.9 kg/m2. All subjects were normoglycemic and none of the subjects suffered from hypertension. Age was significantly correlated to myocardial TG content (r = 0.57, p < 0.05). Figure 1 shows typical examples of myocardial 1H-MR spectra of a younger and an older volunteer. Multivariate analysis was performed to study the association between myocardial TG content and age. Therefore, myocardial TG content was entered as a dependent variable and age and BMI were subsequently entered as independent variables into the model. Furthermore, possible confounders such as plasma non-esterified fatty acids (NEFA), TG and glucose were separately entered into a model with age and BMI as independent variables. In all these models, only age showed a statistically significant association with myocardial TG content. Myocardial voxel localization for 1H-MRS and typical examples of 1H-MR spectra. In the physiologically aging heart, myocardial triglyceride content increases and contributes significantly to the age-related decline in left ventricular diastolic function, independent of body mass index, blood pressure, and biochemical blood markers. Voxel position in 4-chamber (A) and short axis (B) views. (C) Myocardial TG content of the younger volunteer was 0.24% whereas myocardium TG content in the 62-year old volunteer was 0.82%. In addition, myocardial TG content correlated negatively with E/A (-0.68, p < 0.05). Multivariate analysis was performed to study the association between E/A and myocardial TG content. Therefore, E/A was entered as a dependent variable and myocardial TG content, age, and BMI (which were all significantly correlated to E/A) were subsequently entered as independent variables into the model. Furthermore, possible confounders such as plasma NEFA, TG, and glucose levels, diastolic bloodpressure, and heart rate were separately entered into a model with age and BMI as independent variables. The association between E/A and myocardial TG content remained highly statistically significant in all these models. Finally, left ventricular cardiac index (LVCI), a parameter of systolic function showed a significant univariate correlation with myocardial TG content. However, multivariate analysis indicated age as the sole independent predictor of LVCI. In the physiologically aging heart, myocardial TG content increases and contributes significantly to the age-related decline in left ventricular diastolic function, independent of BMI, blood pressure, and biochemical blood markers.